Growing up Mum would made Syrniki, (pronounced sYr-nee-key, usually on a Saturday morning. We would devour them, drenched in sour cream and jam. This breakfast was a treat, as mum had to make the Tvorog cheese in advance. When I went to Latvia in 1991 on an outreach trip with an American team, the hotel made Syrniki and they tasted just like my mom’s recipe. Most of the American teenagers didn’t like the taste of the Tvorog cheese. As a result, I was the only person to devour them, which left me lots of Syrniki to enjoy! I love this Russian breakfast. Syrniki are a fried Tvorog (Quark) pancakes that are popular across Eastern Europe. The quark cheese is is mixed with eggs, flour, sugar and a bit of salt. They are often served for breakfast, but can be made as a dessert as well. They are fried in butter or oil, and are creamy on the inside. Syrniki are often described as pancakes, and many recipes use lots of flour. As the flour increases in the recipe, the Tvorog-Syrniki flavor decreases in my opinion. Less flour = more flavor and keeps the unique tart of the tvorog in the syrniki. 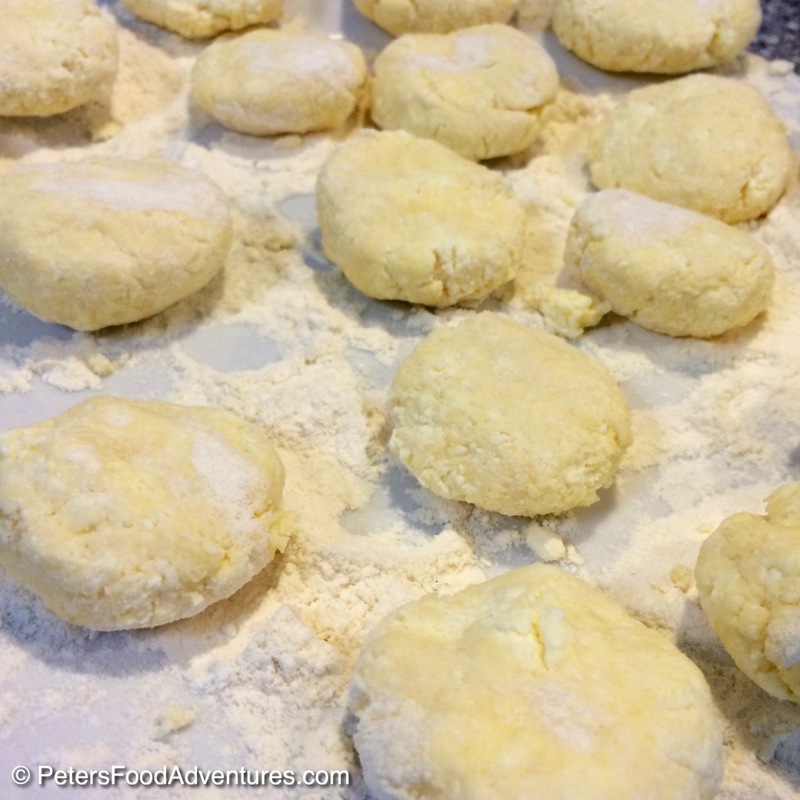 With less flour, the Syrnik will fall apart easier when frying, so it’s a delicate balance. Also some Tvorog you buy are drier than others. If you have a wetter Tvorog, you might need to add more flour. What If I Can’t Find Tvorog? Syrniki are always tastiest when made with Tvorog or Farmer’s Cheese. You can make your own Farmer’s Cheese at home which is very easy to make. Using German Quark also works well. It needs to have a tangy and slightly sourness that comes with Tvorog Cheese. Syrniki aren’t traditionally made with Ricotta, or Creamed Cottage Cheese, but people sometime try to substitute. These aren’t Cottage Cheese Pancakes. If you cannot find Tvorog, Farmer’s Cheese or Quark, then a dry Cottage Cheese can be substituted. I like Syrniki to be more savory than sweet. This means I barely add sugar, and don’t use vanilla or icing sugar. You can add more of those ingredients if you want more of a dessert Syrniki recipe. This recipe reminds me of my mum’s Syrniki, easy to make, ready to be devoured. Serve with lots of sour cream and jam. Bon Appetit! Приятного аппетита! Russian Syrniki, made from Tvorog, Quark, or Farmers Cheese is a delicious Cheese Pancake. Crispy on the outside, creamy on the inside, topped with sour cream and jam. One of my favorite breakfast recipes. In a bowl, mix the Tvorog, eggs, sugar and salt until combined. Add 1/2 cup of flour and mix together. The mixture will be very very sticky. Place ⅓ cup of flour on a work surface.. Make small balls of Tvorog - about 2-3 tablespoons - rolling them like small meat balls on the floured surface. Flatten with your palm, making them into a patty. Heat oil over high heat in a frying pan. The oil is hot enough when you flick a bit of flour into it and it sizzles. Fry the Tvorog patties until they are golden brown and flip over. The coating will be crispy on the outside, and creamy on the inside. Remove from frying pan and place onto a paper towel. Serve immediately with sour cream and jam. This recipe will make about 12 Syrniki Cheese Pancakes.